In response to the initiative to legislate the “Override Clause,” in an effort to castrate the Israeli Supreme Court and limit its independence, Hiddush surveyed the Israeli public's views on this issue with regard to the religion-state clash. Findings from a survey conducted last month by the Smith Polling Institute, commissioned by Hiddush, found that of those who expressed an opinion among the adult Jewish public in Israel, 55% trust the High Court of Justice, compared to 45% who have greater trust in the government when it comes to matters of religion and state. "When it comes to matters of religion and state (such as legislation regarding the enlistment of yeshiva students, exemptions from teaching compulsory core curricular studies, state budget allocations for yeshivas), who do you trust most - the government and the Knesset, or the High Court of Justice?" From the survey data, it emerges that 89% of ultra-Orthodox Israelis trust the government on matters of religious and state, compared with only 26% of secular Israelis. Also, only 11% of the ultra-Orthodox Israelis trust the High Court of Justice, compared to 74% of secular Jewish Israelis! 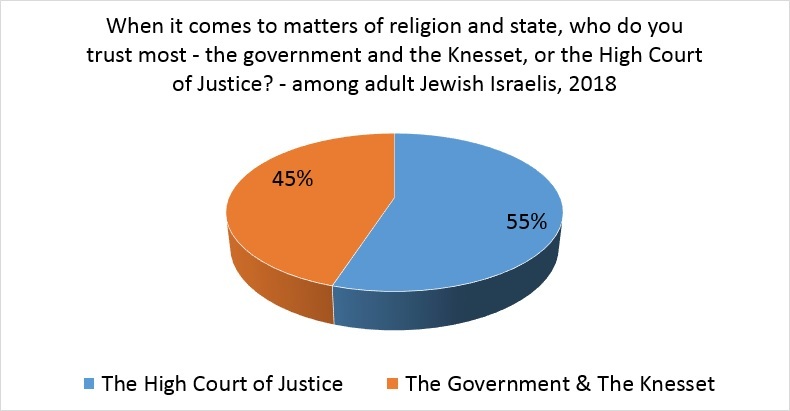 These findings complement and corroborate unequivocal findings, such as those from Hiddush's 2017 Religion and State Index, published in September, according to which the adult Jewish population responded to the question of which relevant public institutions it trusts most: the Supreme Court - 39% expressed the greatest confidence, the Rabbinical Courts - 9%, the Government - 5%, the Knesset and the Chief Rabbinate - 4%! Similarly, in the 2017 Israeli Democracy Index of the Israel Democracy Institute, in response to the question about which public institutions they have trust in, 54% of the adult Jewish public responded that they trust the Supreme Court, compared to - 30% in the government, 27% in the Knesset, 20% in the Chief Rabbinate, and 15% in the political parties! [In the previous question, asked in Hiddush's survey, we measured "the greatest trust" and respondents were asked to mark only one of listed institutions; the Democracy Institute survey measured public trust in general, not necessarily the highest level of trust, and respondents were able to express their confidence in more than one institution]. All those who aspire for democracy and freedom of religion in Israel must oppose efforts to harm the Supreme Court, which is the last wall of defense against repeated political attempts to bring Israel closer towards a theocratic Torah state and to impose on the public the most extreme interpretations of Judaism. Hiddush - Freedom of Religion and Equality focuses solely on issues of religion and state, and Hiddush views attempts to castrate the Supreme Court as repugnant. This is what the leaders of the ultra-Orthodox and the Jewish Home parties demand. The words of the Jewish sages apply to them: 'He who finds fault in others- it’s his own faults that he delegitimizes.' It is not the “tyranny of the High Court of Justice”, as they claim, that is the problem. Rather, it is this attempt to trample on the basic values of democracy and equality in the service of political horse trading. We decry the pretentiousness of the politicians who declare that they genuinely represent the will of the public (rather than the Supreme Court, which, these politicians say, is removed from the people). The opposite is true. The public is distrustful of the political leadership, especially concerning matters of religion and state; and the Supreme Court is the greatest winner of the public's trust. Given this, we hope that there will be individuals and parties in the government coalition who truly see themselves as the public's representatives, who will make it clear to Minister Bennett, his colleagues, and the ultra-Orthodox parties that they will not accept any undermining of the independence and authority of the Supreme Court. They must refuse to support the erosion of checks and balances and the basic values of democracy. The telephone survey was conducted by the Smith Institute on April 16-17, 2018 among a sample of 500 people, representative of the adult Jewish population in Israel (sampling error ∓4.5%).